DevoxxUK is next week and we couldn’t be more excited. Why? Oh, let me count the ways. It will be our first time as an official sponsor of a conference! How’s that for a start? A proud little milestone for us. If you haven’t been to a Devoxx yet and you have your pass, you’re in for a treat. If you don’t have a pass, get one. You won’t regret it. My first was Devoxx Belgium in 2012. Devoxx UK will be my fifth Devoxx event. Does that tell you anything? We unfortunately had a hiccup with the printer who made our shirts and were unable to give any away at JavaLand this March. Fortunately, numerous people showed up proudly brandishing TomEE/Tomitribe shirts from other conferences (JavaOne, Devoxx BE, JFokus) and we had quite the proud Tribe there. After a bit of searching, we’ve got a great new printer and Norm is back. Isn’t he handsome? Come to our booth and get your TomEE shirt. We’ll be parked right next to Hazelcast. If you have a friend who really wants a shirt and cannot attend Devoxx, that’s ok. Come get a shirt for them and yourself. 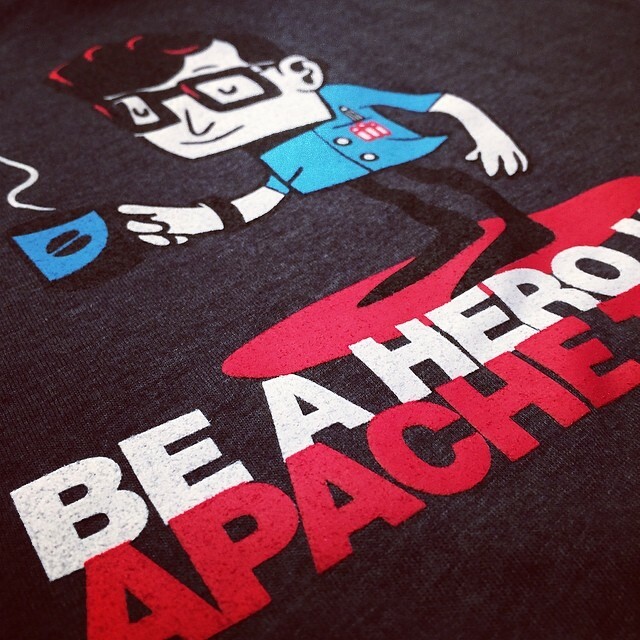 Nothing makes us happier than to see people proudly supporting open source and “Be a Hero with Apache TomEE” on their back. Encourage them to tweet a picture of them wearing the shirt and we’ll call it even. Extra points if you or they do it in a fun or inspiring place. We might have a special thank you at the end of the year for the best TomEE-shirt tweet. There’s already some stiff competition! 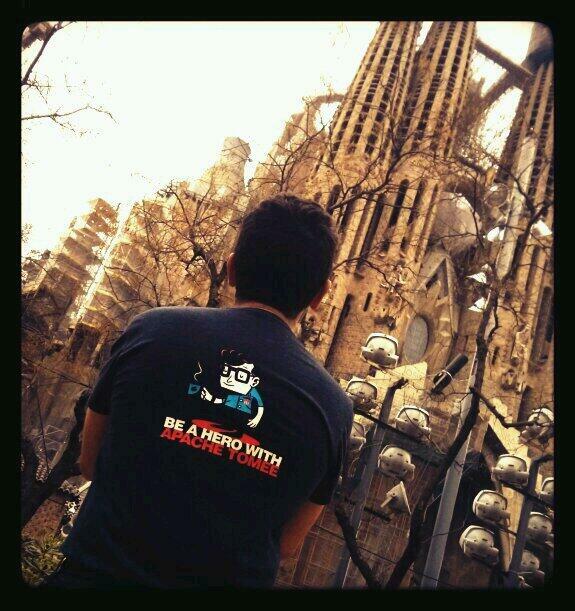 Fabrizio Gianneschi (@javabird) is the current contender to beat with his awesome picture in front of La Sagrada Familia in Barcelona, Spain. Bonus points if you can take it to a friend very far away — I hear there are some excellent landmarks in Brazil. We’re flying in, driving in, training in and I hear some who really want to come but can’t are considering swimming. I wouldn’t advise it, but I’ll be there with a towel if they do! It’s your chance to meet some staples in the TomEE community like Romain-Manni Bucau (@rmannibucau), Andy Gumbrecht (@AndyGeeDe), Jonathan Gallimore (@jongallimore) and Jean-Louis Monteiro (@jlouismonteiro). Of course we can’t forget the energetic Amelia Eiras (@AmeliaEiras) and multi-talented Theresa Nguyen (@RockClimberT). We’re are quite excited to see each other and you. Conferences are a special excuse to bring everyone all together. One that is all to rare for some. Most of our regular conference friends have not met any of the people I mention above. It’s a proud achievement that Tomitribe can bring all these people together to meet you. We absolutely cannot wait to see everyone there; friends old, new and those we’ve not yet met. That means you of course! Perhaps it’s our open source blood, but few things are better than meeting new people and growing the community. If TomEE excites you, throw your inhibition out the window and come say hi and hangout. You’ll be glad you did — and we will too! Join the tribe at #DevoxxUK and help us make this the best one yet!